I wasn’t a big fan of summer camps. Learning how to carve a miniature canoe out of soap wasn’t my idea of fun. So, when my mother first suggested I apply to the Go Palestine Camp this summer I thought, “here we go again.” But as much as I hate to admit that my mom might have been right, it turned out to be one of the best summers I’ve ever had. 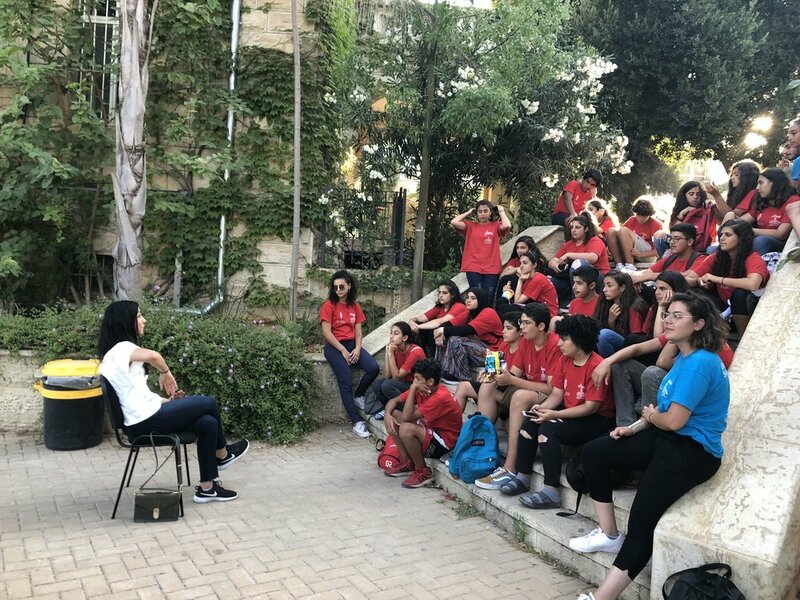 Organized and sponsored by the Ramallah Friends School, the camp brought together forty high school students from around the world for a chance to learn more about Palestinian culture and heritage. Approximately half the campers were from the West Bank. The other half came from the United States, Europe, Asia and other countries in the Middle East, including Palestinians who are Israeli citizens. The camp was staffed by local and international counselors from many different backgrounds. The training and experience of the staff were excellent. The program spanned three weeks full of trips and activities, leaving no time for boredom. Even Fridays, which were free days, were filled with getting together with new friends to explore Ramallah. The language of the camp was English, but many of the campers were knowledgeable, if not fluent in Arabic. Families of local campers in Ramallah hosted the international students, providing a home, meals and transportation to and from the camp. My situation was a little different, since I was able to stay with my Uncle and his family in Ramallah. The camp kept us on the go with some days devoted to traveling to locations in the West Bank and Israel and other days doing activities in and around Ramallah. The Ramallah activities included sports, movies, visiting local businesses, learning traditional arts and spirited discussions about culture and politics. Besides visiting large, familiar cities, like Jerusalem, Bethlehem, Hebron and Haifa, we also got a chance to go to places that tourists usually don’t have the opportunity to visit on their own. We went to Bil’in, one of the many villages in the West Bank that the Wall transects. We learned from the villagers how they were able to partially get the Wall relocated through peaceful protests every Friday. We also visited the Tent of Nations in Beit Jala where local and international activists non-­‐violently challenge the expropriation of Palestinian land. Some of the most memorable and satisfying activities were the community service days. We worked with the Inspire Dreams Program whose mission centers on non-­‐violence, conflict resolution, education, and community development for Palestinian refugees. Along with local children in the camps we helped with cleaning, planting and painting projects. We also worked with the Israeli Committee Against House Demolitions, a non-­‐violent, direct-­‐action organization to resist Israeli demolition of Palestinian houses in the Occupied Territories. We helped to rebuild a demolished house in a village near Jerusalem. Working alongside the villagers and the volunteers taught us about the starker realities of life in Palestine. It also allowed us to give back to the Palestinian community. Though the conditions in the refugee camps could be horrifying I was astounded that neither the refugees nor the family whose house was demolished seemed bitter or angry. I also learned how sometimes the most downtrodden or oppressed people are the most hopeful. I guess that shows the resilience of the people. The camp did a great job of balancing activities that allowed us to understand both the political situation and the culture in Palestine. In part this was done using movie nights with films that captured various aspects of life in Palestine. We watched documentaries, such as Occupation 101, a history and analysis of the current and historical root causes of the Israeli-­‐Palestinian conflict. We also watched cultural movies like Amreeka, which humorously chronicles a Palestinian family’s immigration to the US. It was also revealing to see the similarities between local and international campers. This was not just limited to wearing the red camp T-­‐shirts that made us look like a communist parade when we were out and about in the West Bank. Even though we were born and raised in different countries, I was surprised to discover that the differences among us were superficial, and that we had much more in common with one another than I had expected. In part that’s globalization for you, as we all shared some common pop culture likes and dislikes. The other real unifying part was that for those of us coming from outside we brought with us a familiarity with things Palestinian that we had garnered from our families. This helped to reduce the cultural gap among the campers that might have otherwise existed and allowed us to immediately get along and “know” one another. Overall, I found the camp a very worthwhile experience. I learned first-hand about the difficulties that Palestinians confront in daily life, not the least of which is the separation wall whose sole purpose is to confiscate more land and to isolate and fragment Palestinians even further than they already are. The wall’s impact hits you from the moment you first see it. Just try to get into Jerusalem with a Palestinian ID as I had to. Crossing through the checkpoint between Ramallah and Jerusalem feels like passing into a prison as you are herded through iron gates and inspections. What should be a 15-­‐minute commute can take hours. I found, too, that traveling the different parts of Palestine brings forth a wealth of contradictions. Walk through Hebron, for example, and you’ll notice low-­‐hanging makeshift tarps above you in the old market. No, it’s not to catch rainwater but to shield you from the garbage that the settlers living above throw down. Now look at Haifa in “Israel”. The city looks like any major city you’d find in California. From the seemingly normal activities of its residents you’d think you were a world away from Palestine, not just a few short miles. Most of us in America take a lot of things for granted. And while many Palestinians have to cross a physical wall every day, a wall that stands as a symbol of occupation and oppression, most of us in the United States pursue our normal daily activities not having to fear how life would be if we had our basic human rights taken away. We have yet to cross the emotional and intellectual wall that shields us from the lives and experiences of people in other countries. We need to always remember the most basic principal that this country was founded on: freedom. If we and other world powers want to assert ourselves as role models, then we cannot compromise our own principles and must demand for others that which we demand for ourselves. For those youth of Palestinian background coming from abroad we tend to know Palestine only through the lens of politics, occupation, repression and loss. We often hear about things Palestinian in a language of struggle and despair that drowns out other voices. The truth, though, is more vital and textured. Camp showed us that what lies beyond the physical Wall –and the one we carry inside us, is a Palestine that is as much a people as a place and that it is made of so many facets to be explored and cherished.